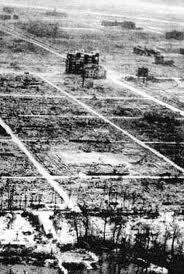 The atomic bombing of Hiroshima in Japan was conducted by the United States during the final stages of World War II in 1945. 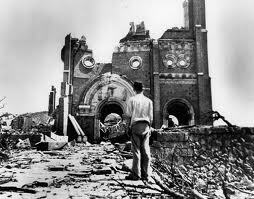 This event and the bombing of Nagasaki represent the only use of nuclear weapons in war to date. Following a firebombing campaign that destroyed many Japanese cities, the Allies prepared for a costly invasion of Japan. The war in Europe ended when Nazi Germany signed its instrument of surrender on 8 May, but the Pacific War continued. Together with the United Kingdom and the Republic of China, the United States called for a surrender of Japan in the Potsdam Declaration on 26 July 1945, threatening Japan with "prompt and utter destruction". The Japanese government ignored this ultimatum, and the United States deployed two nuclear weapons developed by the Manhattan Project. American airmen dropped Little Boy on the city of Hiroshima on 6 August 1945, followed by Fat Man over Nagasaki on 9 August. On 15 August, six days after the bombing of Nagasaki, Japan announced its surrender to the Allies, signing the Instrument of Surrender on 2 September, officially ending World War II. The bombings led, in part, to post-war Japan's adopting Three Non-Nuclear Principles, forbidding the nation from nuclear armament. The role of the bombings in Japan's surrender and their ethical justification are still debated. source-Wikipedia. 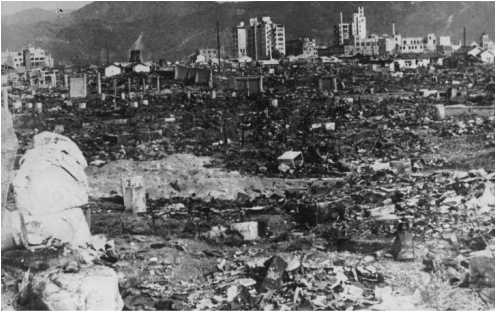 On August 9, 1945, Nagasaki was the target of the United States' second atomic bomb attack (and the second detonation of a plutonium bomb; the first was tested in central New Mexico, USA) at 11:02 a.m., when the north of the city was destroyed in less than a second, and an estimated 70,000 people were killed by the bomb codenamed "Fat Man." According to statistics found within Nagasaki Peace Park, the death toll from the atomic bombing totalled 73,884, including 2,000 Korean forced workers and eight POWs, as well as another 74,909 injured, and another several hundred thousand diseased and dying due to fallout and other illness caused by radiation.This bomb was supposed to be more destructive than "Little Boy" but exploded in a valley, and therefore did roughly the same amount of damage as Little Boy. After the war the city was rebuilt and dramatically changed. New temples were built, as well as new churches due to an increase in the presence of Christianity. Some of the rubble was left as a memorial, such as a one-legged torii gate and an arch near ground zero. New structures were also raised as memorials, such as the Atomic Bomb Museum. Nagasaki remains first and foremost a port city, supporting a rich ship building industry and setting a strong example of perseverance and peace. Hiroshima and Nagasaki References and external links. 3)"Hiroshima Archive". Google Earth mapping of Hiroshima bombing archives. http://hiroshima.mapping.jp/. Retrieved 3 January 2012. 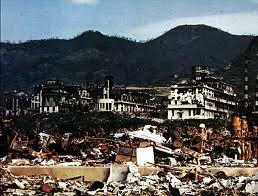 4)Nagasaki Archive". Google Earth mapping of Nagasaki bombing archives. http://e.nagasaki.mapping.jp/p/nagasaki-archive.html. Retrieved 3 January 2012. Archives"Documents on the Decision to Drop the Atomic Bomb". Harry S. Truman Presidential Library and Museum. http://www.trumanlibrary.org/whistlestop/study_collections/bomb/large/index.php. Retrieved 3 January 2012. "The Effects of the Atomic Bombings of Hiroshima and Nagasaki". U.S. Strategic Bombing Survey. Harry S. Truman Presidential Library and Museum. 1946. http://www.trumanlibrary.org/whistlestop/study_collections/bomb/large/documents/index.php?documentdate=1946-06-19&documentid=65&studycollectionid=abomb&pagenumber=1. Retrieved 3 January 2012. 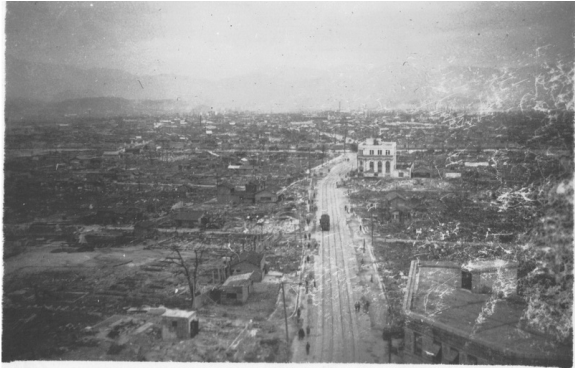 "Scientific Data of the Nagasaki Atomic Bomb Disaster". Atomic Bomb Disease Institute, Nagasaki University. http://www-sdc.med.nagasaki-u.ac.jp/n50/start-E.html. Retrieved 3 January 2012. "Correspondence Regarding Decision to Drop the Bomb". Nuclear Age Peace Foundation. http://www.nuclearfiles.org/menu/library/correspondence/index.htm#decision. Retrieved 3 January 2012. "Tale of Two Cities: The Story of Hiroshima and Nagasaki". National Science Digital Library. http://www.atomicarchive.com/History/twocities/index.shtml. Retrieved 3 January 2012. "The Atomic Bombings of Hiroshima and Nagasaki". Manhattan Project, U.S. Army. 1946. http://www.atomicarchive.com/Docs/MED/index.shtml. Retrieved 3 January 2012. "The Atomic Bomb and the End of World War II". National Security Archive. http://www.gwu.edu/~nsarchiv/NSAEBB/NSAEBB162/72.pdf. Retrieved 3 January 2012. "Nagasaki Archive". Google Earth mapping of Nagasaki bombing archives. http://e.nagasaki.mapping.jp/p/nagasaki-archive.html. Retrieved 3 January 2012. "Hiroshima Archive". Google Earth mapping of Hiroshima bombing archives. http://hiroshima.mapping.jp/. Retrieved 3 January 2012. "Annotated bibliography for atomic bombings of Hiroshima and Nagasaki". Alsos Digital Library for Nuclear Issues. http://alsos.wlu.edu/adv_rst.aspx? CommemorationAn Unrecognized Loss – Message From Hiroshima (film) http://www.un.org/disarmament/education/Movies/an_unrecognized_loss/Hiroshima and Nagasaki: A Look Back at the US Atomic Bombing 64 Years Later – video by Democracy Now!